Drama. “Trade Productivity” is the primary determinant of the success and longevity of a sovereign nation regardless of what culture or social “ism” the people of that nation might have. Nations that cannot compete, or will not compete, or are excluded in global trade, will always wither and die at great expense to its people (Reuters, October 2, 2014, IMF head warns against ‘the new mediocre’). Obviously, the times have changed and the 18th-century circumstances of Adam Smith (1723-1790) are long forgotten in our day-to-day. But we have cause to wonder why the great nations of Tonga and Samoa, among others in their time and place, are not yet in the same league as Great Britain, Brazil, France, Germany, China, or the United States, for example, which were hardly them, then; please see Exhibit 1 below for more information, but before we can do that, we need to talk about “money” so that we’re clear on what it is. In our previous Post “(P&I) World Trade & Trade Productivity“, we noted that what goes on inside a nation is none of our business, but because the government is the source of its currency, we know that the government will tend to have the Company D modality, α = 1/e =0.368…, or typically less (please see Figure 1 on the right). And the more or less will be determined by how much debt the government has to service outside of itself in order to “stay in business”, so to speak, because the funding for that debt comes only from the funding and enterprise provided by its people, in taxes, tariffs, fees, and loans, for example, and its success in global trade, even if the trade balance is zero, but there must be trade. A sovereign nation will print its own currency, but the “value” of that currency depends entirely on the success of the nation in foreign trade, and both the funding provided by its people, and its success in global trade, will be determined by the “productivity” of its people in producing an excess of consumer goods and services that they might be able to sell, and on its success in acquiring foreign goods and services that might enhance the productivity and well-being of its people. It’s a simple equation but there’s denial all over the world, and regimes of conquest, terror, or confiscation, are not an exception to that rule. 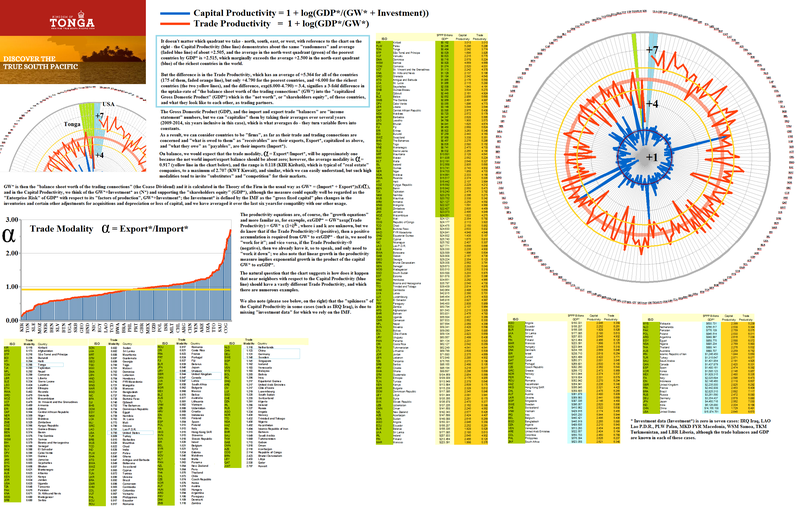 In Exhibit 1 below, we’ve graded the Capital Productivity and Trade Productivity by the “capitalized Gross Domestic Product” (GDP*), and despite the “noise” (which we’ll talk about), we see that the nations in the “northwest quadrant” with the least GDP*, from less than $1 billion in Samoa (WSM) to about $20 billion in Namibia (NAM) and Mozambique (MOZ), have a more or less “random” Capital Productivity” (blue line), which is like every other region of the chart when graded by GDP* – it doesn’t seem to matter how much money they have – but a decidedly low Trade Productivity (orange line), that is much lower than that of those countries that are “in the money”, so to speak, and of course, differences in the Trade Productivity between near neighbors in the Capital Productivity raise some questions (for them) about what’s going on in their trade business, and what might they do about it; please see Figure 1.1 below and click on it (and again) to make it larger if required. For more information on the “Five Equations of State”, and an introduction to the terms that we have used here, please see our Post “(B)(N) Through the Looking-Glass“, and for the really hard rocks, the Theory of the Firm which is based on The Process. ← (B)(N) Volatility Ho! – Ha!